First of all dear Joey congratulations for 200 challenges! 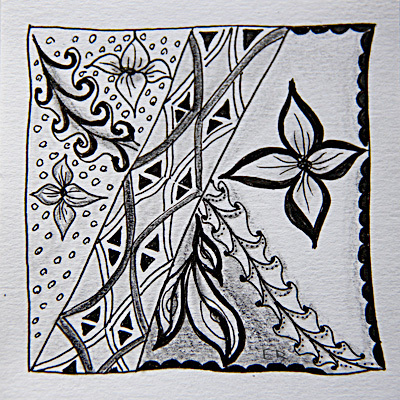 Just in time with your challenge 200 I restart my Zentangle activity. After a long break I am somewhat out of the exercise and I have to find myself again. Thank you Joey for this interesting task. muss mich erst wieder einfinden. Thank you very much for any feedback. Your tile is charming albeit being your 'warm-up to Zen-tangling' tile. I know it is not easy to start again; I feel like having 20 toes only after a day or 2 missing out.